Octopus's are well known to be great escape artists and in 2016, Inky, an octopus at an aquarium in New Zealand made the news when he escaped from his tank, crossed the floor and returned to the ocean via a drain. 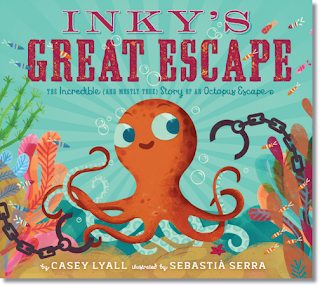 Canadian author and librarian, Casey Lyall, has taken this news story and built upon it very nicely for her first picture book - "Inky's Great Escape - The Incredible (and mostly true) Story of an Octopus Escape." Feeling tired from all of his escaping, Inky decides to retire to the local aquarium for a rest. In his tank, Inky spends the day playing games of hide and seek and charades with his tank-mate Blotchy. At night they play cards (crazy eights) and Inky tells tales of all his great escapes. Having spent his entire life in the aquarium, Blotchy understandably finds it hard to believe his friends wild tales so bets him that he can't escape from the aquarium. Inky agrees to the bet and declares that it will be his "biggest escape yet". While Blotchy feels sure that escaping will be impossible, Inky knows better. From all his years of escaping from traps her has learnt that you need careful planning and patience - so he sets about drawing up his plans. When the time come, Inky makes his escape and asks Blotchy to join him on the great adventure. Blotchy refuses the offer - after all, it's "Fondue Friday". After Inky escapes, Blotchy is left with a tale of his own to tell to the new arrivals at the aquarium and justifies his staying behind with the thought that someone had to do so to tell the tale.